Music: Jose Gonzalez, Veneer – His song Heartbeats is a popular one, but the rest of the album leaves you with the same feeling, a little tickle and the yearning to press “REPLAY”. First, I apologize if you got a little preview of the pics from this meal! I unfortunately have been couch ridden with some torn muscles is my back…yea, ouch. I have been sleeping about 4 hours each night, which means early mornings spent in front of the computer and I accidentally pressed the wrong button, whoops! Anyways, this meal was great. 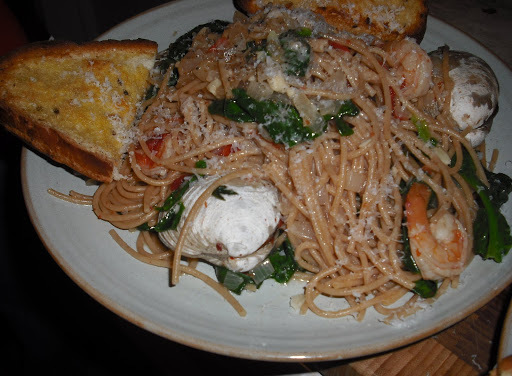 There is definitely room for improvement and there will be a few changes next time we venture with a seafood spaghetti. But all in all it hit the spot. I crave seafood. The Florida girl stuck in the middle of the U.S…go figure. It’s difficult to find quality seafood, but I thought this would be a safe bet with shrimp and clams. The clams were okay. 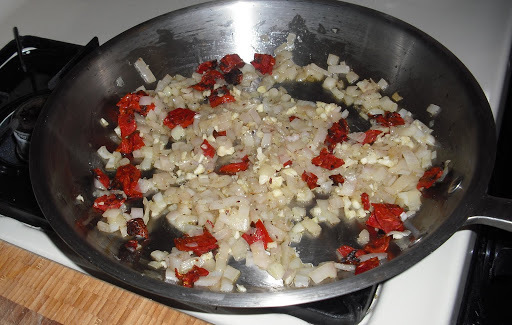 The first step of cooking was homemade oven dried tomatoes. Well worth the extra step instead of using the store bought oil packed sun dried tomatoes (I can’t find the ones not packed in oil!). We had a bunch of romas and san marzanos from the garden and they were on the verge of going overboard, it was just meant to be. 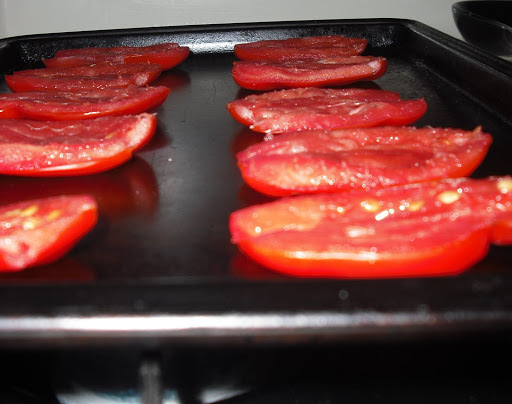 So, I drained the tomatoes well (salted and then pressed into paper towels for an hour or so) and threw them in a low heat oven for while. They burned a little on the edges, but had tons of flavor. 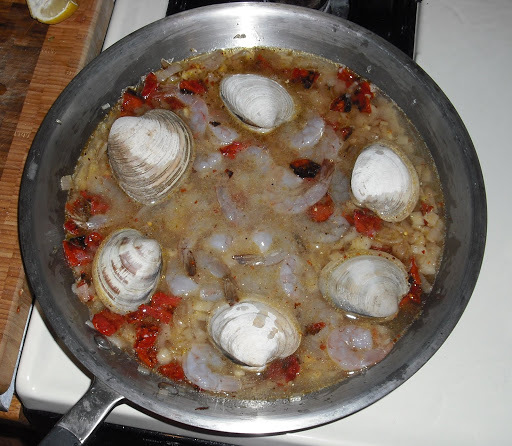 The clams and shrimp cooked in wine. This took a lot longer than I thought. The clams took over 10 minutes to open. 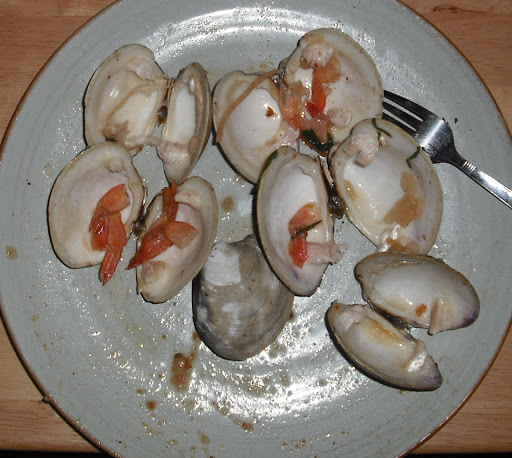 The recipe I used said to put the shrimp and clams in at the same time, but this left the shrimp a little over cooked and me begging the clams to open…all but one did. Tossed with whole wheat spaghetti, fresh spinach and topped with lots of parmesan and we felt like royalty eating this one…it was definitely the perfect meal for a romantic night with your honey. On another note, I have recently been getting fresh batches of grown spinach as opposed to the baby spinach in the box from Costco and I must say we’ve been missing out. The spinach is usually pretty dirty, so washing and washing again in advance is a must. However, the final product is far better. The fresh spinach is more like thick hearty greens as opposed to the baby spinach, which is much more like lettuce. 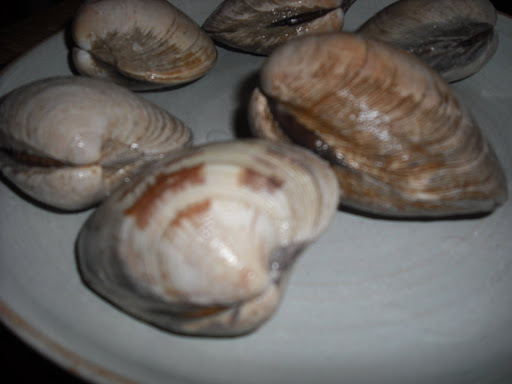 Clams – I thought 3/person was good, but whatever you feel is best. In a large stock pot, heat water and salt generously. Add pasta and cook until al dente, about 8 – 10 minutes. Drain pasta and set aside. Heat EVOO in large pan. 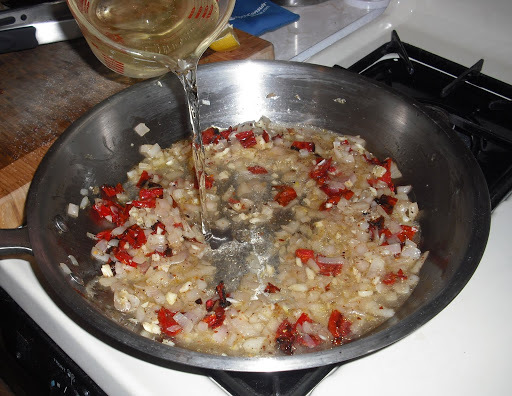 Add shallots and cook until softened, about 5 minutes. Add garlic, tomatoes, and seasonings. Cook for another minute. Turn the heat to high and add wine. Place clams in the pan and scatter shrimp. Bring to a boil and turn heat down to simmer. Cover and let the seafood cook, until the shrimp are pick and clams open, 7 – 10 minutes. 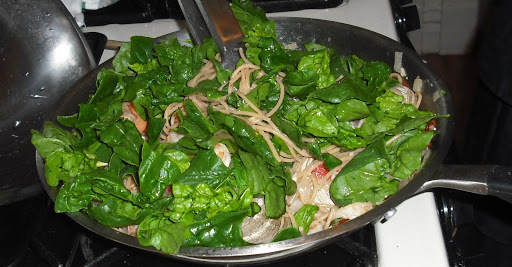 Add spaghetti and spinach to pan and stir to combine. Top with cheese and basil and serve! 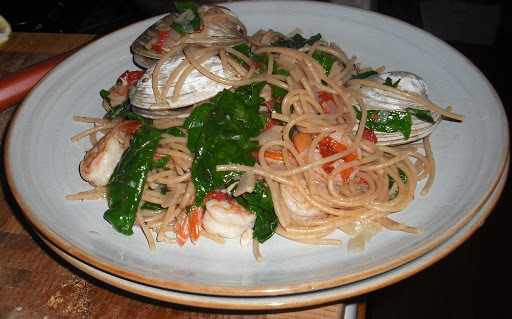 This entry was posted in Pasta, seafood by callywoodfarms. Bookmark the permalink.